I found this forum while attempting to find out some information via google. A few years back I built a nice little grill out of some 16 inch heavy wall pipe. I'm currently on the road so I am unable to take pictures of it. It is roughly 26 inches long, with bull nose caps on each end, cut horizontally one inch above the center line so that the entire top half of the grill lifts up allowing you ample room to the grill area. I honestly cannot remember now if the stack and air intake are 3 or 4 inch pipe, they have a flat round plate welded to a solid steel rod which forms the handle allowing you to control your air flow like a ball valve. it cooks wonderfully, however I misjudged the backstop for the lid so it opens a bit too far and will tip the entire grill if you don't gently open the lid. have plans to fix that this week when I get home and have a few days off. I also would like to build a larger base as I am using an old Disk from an offset plow. My main question was about air flow and counter balancing the lid by angling the smoke stack at 45-60 degrees. Has anyone ever attempting this? Does it ruin your air flow? 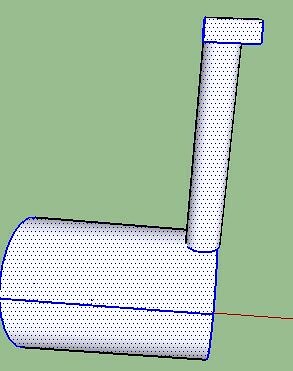 would I need to go up an inch in size on the smoke stack to account for the angle reducing the direct upward flow of air? TL;DR Can you angle a smoke stack to act as a counter balance for your lid, also would like creative ideas for a stand/base for the grill. Welcome to the ring Athecal, looking forward to seeing some pics of your cooks. I could sure use some pics or drawings to see what you want to do. 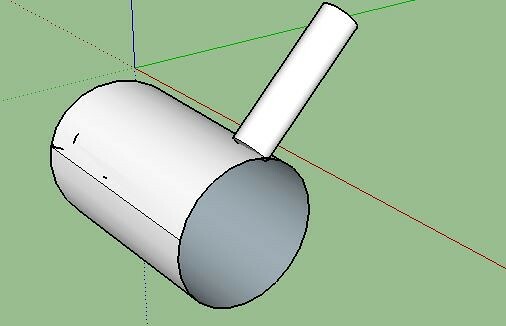 So after figuring out this SketchUp software and reaffirming why I chose computer programming over graphic design, I've got some crude sketches of what I am talking about. This is a crude design of my grill as is. This is the way I was thinking of positioning the smoke stack. Sorry about the terrible quality of the drawings. If this is a grill then your exhaust need only be about 6" tall it is not like a smoker that requires draft through an exhaust it just needs proper intake and a decent opening to escape. I have one 3" exhaust on my 20" x 36" grill and it easily gets to over 400°. To answer your question about the angle I do not see a problem with it if that is what you are wanting in the end. That's one nice setup you got there really like the window weights on pulleys, and thanks for your reply. I cook with wood about 90% of the time on my grill and was worried about disrupting the airflow. I did not think it would hurt it to angle the stack but wanted the opinion of someone with more knowledge than me. The main reason I was interested in angling the stack is to create a counter weight for the lid.